Come See us at The Ki in San Francisco! 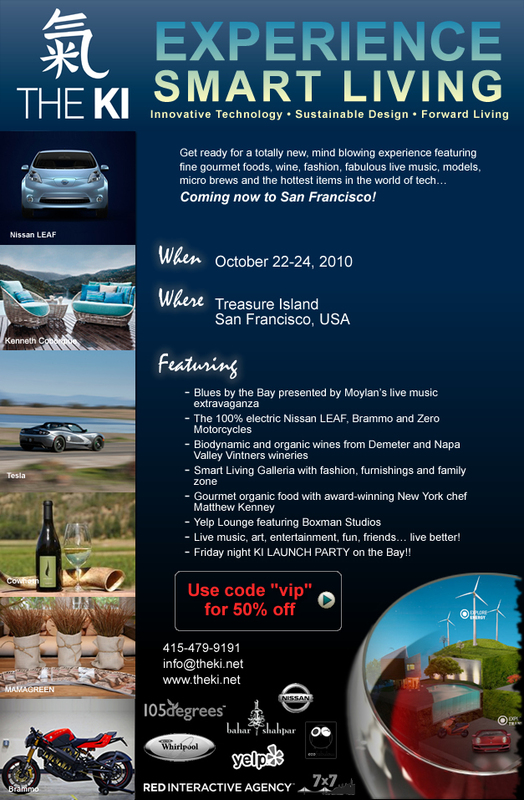 Better World Club is a sponsor of THE KI (key) an innovative, smart-living experiential lifestyle event on Oct. 22-24, 2010 on San Francisco's Treasure Island. Established as a platform to present the latest in advanced thinking and smart-living, THE KI will join some of the world's most innovative brands (Innovative? Oh, go on. You're embarrassing us...but we'll take it), designers, thinkers, leaders and influencers to share the future of better living. The all-electric Nissan Leaf will be there as well as the Zero Motorcycle. And, through Better World Club, you can get 50% off the price of regular admission. Just enter "vip" (lower case) as the discount code when you purchase your tickets online. Check out this flyer for details. Better World Club will, of course, be there -- and we didn't get 50% off either. But we want to celebrate your discount, so come see us if you'll be in San Francisco this weekend! More about THE KI here.